Stephen King is many things. Pulp fiction novelist, hack, megalomaniac mass producing machine of cheap literature, etc. He is also a brilliant writer, and a great influence on modern literature and pop culture. Having written about 50 novels, it goes without saying that not all his books are equally brilliant. Some are mediocre, some are just boring, and some are nothing but rehashes of things other people have done better before. But there are some which are mind expanding. Firestarter is one of these novels. However Stephen King is not only a vastly successful writer, he has also been "blessed" with having an amazing amount of his work adapted for the screen. Again, many of these films are horrible butchering of the original work. But a handful of films were able to retain some of the glory from the books, and turned into excellent films. 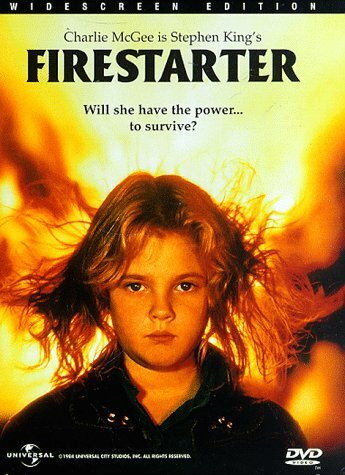 Firestarter, the film, is definitely among the best, much thanks to Drew Barrymore, who gives us what must be the greatest performance by any 9 year, in the history of film.